Elizabeth City, NC - While the first official day of summer isn't until June 21st, you're more than likely to kick off the summer with some celebrations before then. We don't know about you, but we're ready to let the good times roll! As your backyard BBQ gets underway, make sure you stay safe and follow these 10 Best Practices for Grilling. One of the mistakes people make when grilling is not properly setting up the grill. If you find yourself with overcooked or undercooked meat, try setting your grill up using zones instead of just dumping in the charcoal or turning all the gas knobs to high. Setting up your grill in two or three heat zones will give you far more flexibility when it comes to creating a delicious outdoor-cooked meal. Having, at the minimum, a hot side and warm side, you’ll be able to control how fast your food cooks and control flare-ups. Think of your grill as an oven, and use it just like restaurant chefs do. Sear your meat on the hot side, and then move it to the cooler side of the grill until it reaches the desired doneness. If you have trouble cooking your meat to the proper doneness, give the “reverse sear” method a try. With the “reverse sear,” you start with your meat on the cooler side, or “indirect” side, of the grill. With the grill covered, cook the meat until it reaches 10 to 15 degrees below the final doneness you want. Immediately move the meat over to the hot side of the grill and sear the meat a couple of minutes on each side. Searing the meat will give you the deep flavor of caramelized meat everyone wants. It will also raise the temperature another 10 degrees or so. The final few degrees to desired doneness will come during the time you let the meat rest before carving and serving. *Resting: Allowing the hot meat to cool to about 120 degrees to 125 degrees. Contrary to what your father may have told you when you were younger, dirty grill grates do not mean more flavor. Crud on your grill grates is not flavor—it’s just crud. Clean your grill grates. If you’ve taken good care of your grill grates and they are properly seasoned, you don’t need to oil them before you cook your meat. Personally, I prefer to treat my grill grates the same way I treat my cast iron cookware. Clean them after use, and then apply a thin coat of oil. This keeps them properly seasoned. What happens when you try to apply oil or cooking spray to a 600+ degree grill? Yep, it smokes like crazy. That’s because the oil is burning. That defeats the purpose of oiling the grates and makes your food taste bitter. When oil reaches its smoke point it stops being a lubricant. By putting a high smoke point oil, like olive oil, on your meat it increases the smoke point and helps keep the food from sticking. on the internet, but trust me—this is the best way to go. Your grill is a lot like your indoor oven. You don’t use the oven without preheating it; don’t use your grill without preheating. Preheating your grill serves two purposes. First, it provides a stable heat from which to start cooking. Having a properly preheated grill means you don’t have to worry about what happens as the grill heats up. And, it certainly won't help your ability to sear the meat. Second, and most importantly, preheating your grill will help keep the food from sticking. Have you ever tossed meat into a cold pan on the stove and then tried to turn it over. Doesn’t work very well, does it? Having everything together and ready to use when you start cooking will not only decrease your cooking stress level, but it will also decrease the amount of burnt food you end up with. The next time you preheat the grill and toss the meat on, remember one thing: “If you’re looking, you’re not cooking.” Put your food on the grill and let the heat do the work. If your grill is properly set up, meaning your grates are clean and your meat is oiled, the meat will let you know when it’s time to turn over. The meat will actually release from the grill. If it’s still stuck, it’s not time to turn over. A special “leave it alone” note for when you cook hamburgers: For all that is good in the world, don’t squish all the juices out of the burger with your spatula when you turn the patties over. That juice you just squeezed out onto the charcoal is flavor! BBQ sauce is a condiment! You don’t put mayo, mustard or ketchup on your burger while it’s cooking, do you? Why would you put the BBQ sauce on before it’s ready to serve? You shouldn’t. Today’s BBQ sauces are full of sugar. Whether it is high fructose corn syrup or natural sugars found in tomatoes or other ingredients, the result is the same. No matter the source, sugar burns. Don’t sauce your meat until 10 minutes or so before it’s done. Two light coats, five minutes apart, is much better than one thick coat. You want the sauce to adhere to the meat, or “set” instead of burning. Nothing tastes worse than burnt BBQ sauce. Another option is to cook your meat without sauce and serve the BBQ sauce on the side as a condiment. Let your guests decide how much sauce they want. Every year thousands of people get sick from bacteria they picked up during an outdoor cookout. Keep your grilling area clean. Wipe up spills as they happen. And most importantly, don’t let cross-contamination be a factor in someone getting ill. Don’t use the same tools to handle chicken that you used on beef or something else. Contrary to popular belief, cooking your food does not “kill the germs.” Making sure you lessen the chance of germs is a much better course of action. Clean, clean and clean again. And, use anti-bacterial wipes whenever possible. Better safe than sorry is the best advice. Have you ever had your grilled fish fall apart when you turned it over? It’s probably because you tried to turn it over with the same spatula you used to flip your burgers. Big, giant spatulas are for flipping big, hardy things. Fish needs to be turned over delicately, and for that you need a fish spatula. Big spatulas for burgers, fish spatulas for fish, and tongs for steaks are just a few of the tools you need. If you use the proper tools, it will make life so much easier for you around the grill. During the cooking process there are two resting periods for your meat. The first is when you take the meat out of the refrigerator. Let the meat rest on the counter until it is at room temperature before putting it on the grill. You can even season it at this point and let the seasoning work it’s flavorful magic while it comes up to room temperature. 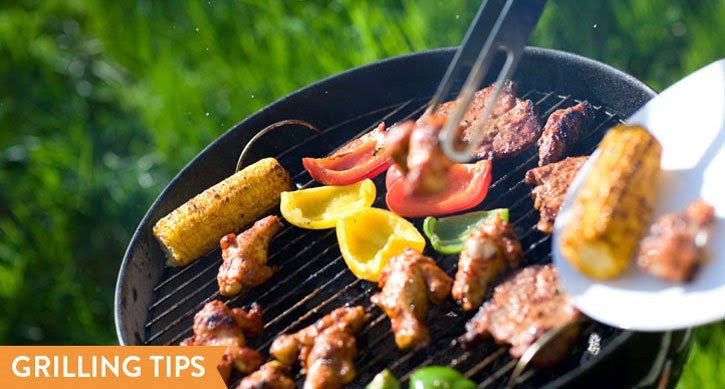 We hope these tips will help when you fire up the grill this summer! If you are ready to kick off the summer with a brand new grill but need a bigger vehicle to haul it, check out the brand new 2014 Chevy Silverado! Perry Auto Group has two dealership locations at 1005 W. Ehringhaus St, Elizabeth City, NC, 27909 or 1001 Halstead Blvd Elizabeth City, NC 27909.